GoodNotes is a companion app for existing GoodNotes iOS users. GoodNotes for iOS is an handwritten notes app on iPad/iPhone. 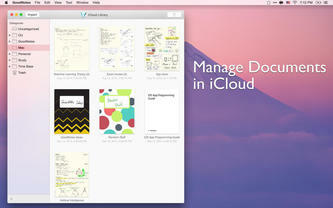 GoodNotes for Mac lets you view and manage your handwritten notes and documents in GoodNotes’ iCloud library. Stunning Digital Ink: Your handwritten notes look beautiful on your Mac with high-resolution display as well as on your iOS devices. GoodNotes for Mac is powered by the same state-of-the-art digital ink technology as on its iOS version. iCloud Sync: Access to all your GoodNotes documents with fast iCloud sync. Sketch and annotate documents on your iOS devices and view them on all devices. Import PDF's and Images: Drag-and-drop documents and images between GoodNotes and your Mac. Document Versioning: GoodNotes automatically saves versions of documents as you work on them. Browse through document versions and restore pages from old versions. Share and Print Documents: With access to all your documents in GoodNotes, sharing and printing documents require only a few clicks. Page Rearrangement: Drag-and-drop to reorder pages in documents or to copy pages between documents. Bookmark: Add bookmarks to your documents.